Sprinter Gabby Thomas ’19 has been breaking program records since she joined the Crimson in 2015. This winter, she made history, becoming the fastest collegiate woman to run the indoor 200-meter. Her 22.38 mark in the final heat of the NCAA tournament meet—which won her an individual championship—is the fifth-fastest time ever run indoors at 200 meters by a woman worldwide. For junior forward Ryan Donato, a big year kept getting bigger. In February, he competed with the United States national team in the Olympics. A bright spot in the Americans’ seventh-place finish in South Korea, Donato scored five goals in five games—besting the four goals his father, Crimson coach Ted Donato ’91, netted in the 1992 Games. In March, the younger Donato turned professional, joining the Boston Bruins, recording a goal and two assists in his debut with the team. One of three finalists for the 2018 Hobey Baker Award, Donato planned to finish his spring semester courses, and to return later for his degree. Three of his Harvard teammates, all graduating seniors, also signed professional contracts this year. The Crimson finished the season with a 15-14-4 record. The top-seeded Harvard women’s squash team closed out a 15-0 season with its fourth consecutive national championship, beating Trinity College 9-0 to win the Collegiate Squash Association’s Howe Cup. In individual competition, defending champion Gina Kennedy ’20 fought her way back to the national title game, but lost there to Penn’s Reedham Sedky. After a 13-3 season, the Crimson men were edged out in the national title game by Trinity, a perennial powerhouse that took home the Potter Cup for the second year in a row. But senior David Ryan clinched an individual national title, defeating Trinity’s Kush Kumar, the overall top seed, in a come-from-behind win in extra points. Led by swimmers Dean Farris ’20 and Brennan Novak ’19, who between them broke five conference records at the Ivy League championships, men’s swimming and diving defended its 2017 title and went on to the NCAAs, where the team earned eight All-America honors and finished eighteenth, the top Ivy score in the tournament. The women’s swimming and diving team also clinched an Ivy championship, its third in five years. Sophomore swimmer Miki Dahlke and senior diver Jing Leung went on to NCAA competition, two of the tournament’s four Ivy athletes. 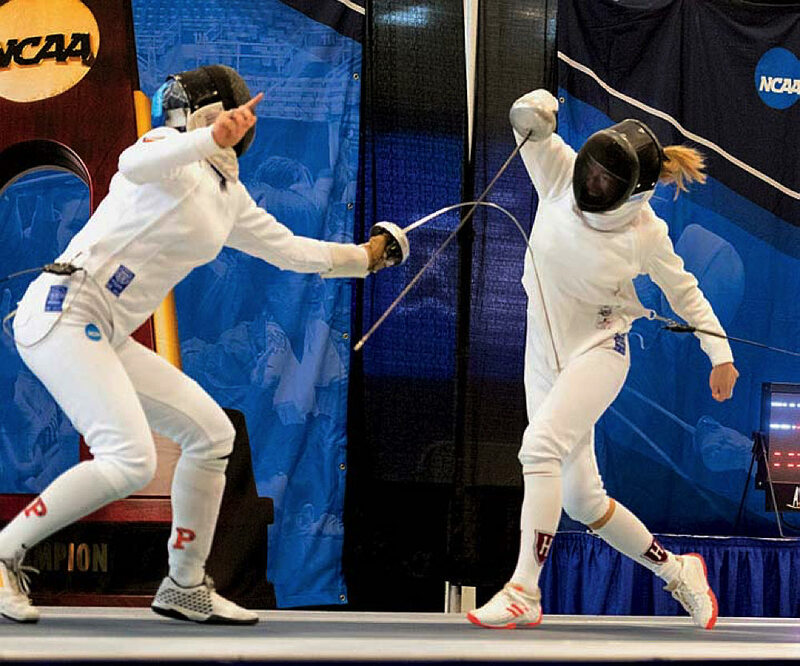 Harvard sent 10 fencers to the NCAA championships in late March, including junior co-captain and 2016 Olympian Eli Dershwitz, who earned his second sabre title in as many years, a first for the program. Competing in épée, Cindy Gao ’21 claimed an NCAA bronze. Men’s and women’s fencing teams won their respective Beanpot championships: for each, the eleventh straight title.